Would you like to receive email reminders of our upcoming productions and auditions? LAUREL LITTLE THEATRE TURNS 50! 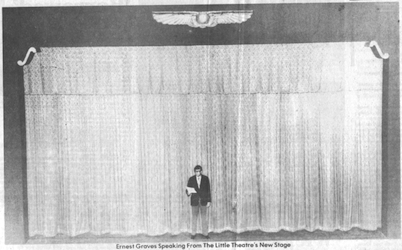 Our Laurel Little Theatre was organized back in August 1961 when four local theatre lovers first got together at the old bowling alley that used to be next door to the Leader-Call newspaper. Marda Kaiser Burton, Mary Anne Sumrall, Ernest Graves and Gene Gandrau hashed out their ideas and quickly called for an official organizational meeting at the old Pinehurst Hotel Coffee Shop. Some of the group that joined in with them at the Pinehurst were well known Laurel names like Jim Gibbon, Annie Ruth Grim, Page Jones Harris, Billy Howard Jr, Billy Lightsey, Ruth Tomlinson, Dot Traweek and Granville Walters. Their goal was to present Laurel citizens with entertainment and to give would-be thespians a chance to get up on a stage and ham it up for their friends and family. Now five decades later, that's still our main goal at the theatre. Little did those founders know in 1961 that one day that very group they organized would be performing in the old Arabian movie house just right next door to the Pinehurst Coffee Shop where they were meeting to form the group. 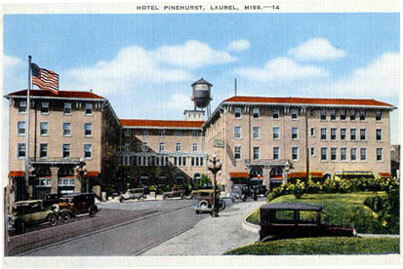 The Pinehurst Hotel in the 1930s. The Arabian Theatre was attached just behind all the room windows on the far right side of the hotel. The entrance to the theatre is marked by a yellow & white striped awning at ground level on the far right side. There was a fifty foot long lobby that ran on the ground floor under the hotel rooms. The Arabian had opened on April 1, 1927, not long before the stock market crash that ended the explosion of movie palaces that were built in the 20s. From 1961-1966 each play of the season presented two performances at either the Wisner Building, Mason Elementary or Watkins High School. In 1967, LLT leased a 'real' space for ourselves in the old Downtown Armory Building and built a stage and a small front lobby. We were such a small operation that when we raised enough funds to buy a chilled-water fountain, it made the front page of the daily Laurel Leader-Call! Most seasons included three productions, and we had moved up to presenting three performances of each of those shows, occasionally performing at the Lauren Rogers Museum of Art as part of a 'Sunday at the Museum' Series. Laurel's Downtown Urban Renewal forced us out of that building in 1976 and put us out on the streets once again. We performed at various city schools for almost two years while we envisioned big dreams of having our very own space again someday. 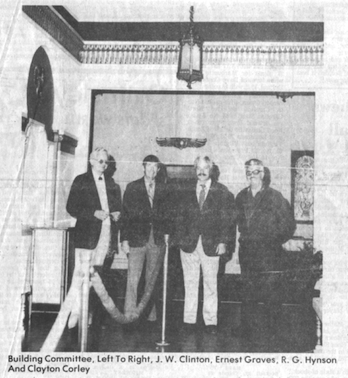 Local businessmen and LLT favorites Bill Clinton, Bobby Hynson, Bill Mullins, Gardiner Green Jr and Clayton Corley headed up a building committee that began searching for a space and for the funds to acquire it. In 1976 several buildings were strongly considered, including two of downtown Laurel's famous movie palaces. We looked at both the Strand and the Arabian Theatres, both of which were out of business. 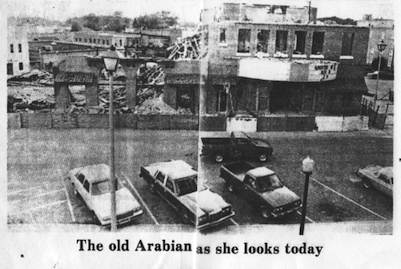 The Arabian had shut down more recently than the Strand and was in better shape, so it became our pick, and local architect John Hunt guided the group through the renovations. The original 1927 paint colors and the Arabic, Persian and Egyptian features were restored before we reopened the building in our 1977-78 season with a production of Our Town. That building committee worked hard with a three year plan from local businesses and individual patrons to pay off both the purchase and renovation costs which totaled just under $100,000, and our building was debt-free in an unbelievable three years! Since moving into the Arabian, each season usually has four productions, and most of those run four performances, although our big musicals are often held over for extra showings and have folks seated in the aisles just to get everyone in. The biggest hit of our history has been the popular Always...Patsy Cline which has returned several times over the last decade and always sells out 8 or 9 performances. Over 5000 folks have now seen that production over the years. Part of the sad history of the south is the era of segregation and Jim Crow laws, and Laurel and the Arabian Theatre were no different. It is important to remember the problems of the past, so we all learn and continue to move forward. The stairwell we currently use to access the balcony was originally the 'colored' entrance to the balcony, and the 'white' stairwell used to exist where our kitchen is now situated. African-American Laurel movie-goers had to enter the building from a side door and go up separate stairs. They not only didn't sit with the white patrons, but they couldn't even use the same restrooms or stairwells. My, how things have changed for the better. LLT has had many great black actors and actresses over the years, and we've presented several shows with all-black casts or subject matter. Our theatre has always existed to entertain, but we're often able to enlighten and advance a modern thought process as well. Women's issues, racism, gay characters, McCarthyism, the Nazi era and religion and politics on both sides of the aisle have all raised the occasional discussion in the community. We're proud to be a part of that and present some of those subjects along with our popular comedies and light hearted musicals. Tom Lester (that played 'Eb' on TV's Green Acres) was in our very first production of Born Yesterday back in 1961. Rufus Smith directed All The Way Home for us in 1964 just a few years after starring on Broadway with Ethel Merman in Annie Get Your Gun. 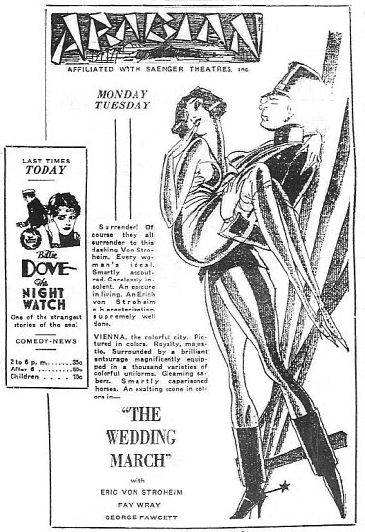 Rufus was married to Laurel's Evelyn Taylor whose dad Sank was the owner of both the Arabian and Strand Theatres. Evelyn had moved from Laurel to NYC and was a dancer with Agnes DeMille's company and appeared in the Broadway productions of Carousel, Brigadoon, Camelot and Paint Your Wagon and was in the movie version of Oklahoma. Talmadge Harper and Dennis Bailey directed several of our productions in the 60s and 70s and both were featured singers for NYC's Metropolitan Opera. Tom Elias sang in several of our 60s shows and went on to make his Broadway debut in the musical Cleavage. Both Michael Howard and Wess Hughes have many LLT credits over the decades and went on to produce, direct and act in professional shows in New Orleans. Patrick Weathers was 'Stanley Kowalski' in our 1978 A Streetcar Named Desire just a few years before becoming a cast member of NBC-TV's Saturday Night Live. Parker Posey went on to become known as the 'Queen of the Indies' and also starred in movies like Party Girl, You've Got Mail, Superman Returns and Waiting for Guffman years after appearing in our production of Harvey in 1981. Mary Elizabeth Ellis was in shows in the 90s before she moved to L.A. and became a cast member of FX-TV's Always Sunny in Philadelphia. Erin Napier is the co-host of HGTV's home renovation series, Home Town. Back in 2003, she was one of the infamous 'Cell-Block Tango' jailbirds in our production of Chicago. Under the guidance of 2008-09 Board President Amanda Robertson, theatre expert Bill Hooper and committee chairmen George Jackson and Robbie Robinson, we've recently completed a major renovation of the old theatre to spiffy the place up with lush all-new seating and carpeting, an interior paint job and upgraded wiring, uncovering some of the original 1927 artwork and the restoration of the locally famous Arabian neon sign to shine brightly over downtown Laurel. We have tons of great ol' stories and photographs of LLT productions, the Arabian and Strand Theatres and the Pinehurst all posted here on the website. Our 2010 - 2011 season will be our 50th anniversary. Over the years we've presented just shy of 200 different productions, and it's taken hundreds and thousands of volunteer hours to fill our casts and crews over the five decades. LLT is a proud part of the Pine Belt and welcomes anyone interested to come on down and join in. It's hard to imagine now just how astonished folks were when movies were first presented back at the beginning of the last century. In 1907, the people in Laurel saw their first 'moving picture show' when Sank Taylor hung a sheet on a back wall in a small building next door to the old O'Ferrell Building and brought in a strange looking machine that would project bigger than life images of cowboys & horses, fast moving trains & damsels in distress, pirates & their stolen loot and the new stars like Rudolph Valentino and Charlie Chaplin. Since the invention of television was many years away, these movie houses became the centers of social activities in towns all over the world. Sank Taylor went on to operate several movie houses in downtown Laurel, and old timers fondly recall those palaces where they'd spend countless hours watching newsreels and serial stories along with the main attractions of the day. Mention Laurel theatre names like the Jean, Ritz, Bijou, Royal, Lincoln, Strand and the Arabian, and those folks that were around in the first half of the last century will nod and crack a smile remembering the many hours spent in the darkness watching their favorite stars, munching on the penny candy and popcorn and maybe stealing their first kisses in the far reaches of the balcony. The Strand was built on Central Avenue for $174,000 and opened on February 5th, 1921. At that time it was one of the most expensive and impressive theatres in the state of Mississippi. It was very ornate with curtained box seating, a full stage with fly rigs and dressing rooms and a famous olio house curtain that had local business names and advertising painted on it. 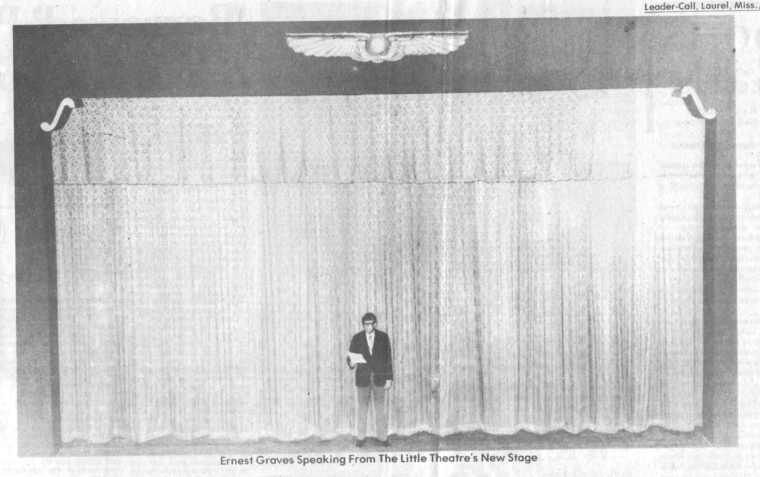 Six years later, Sank Taylor and his investors spent $150,000 building the Arabian Theatre and then another $50,000 gloriously furnishing it and installing 'air-cooling.' The Arabian became the palace for first class new-run 'A' movies and the Strand became the home for 'B' flicks and cowboy movies. Both of them showed the newsreels that for many folks were the only sources of information of what was going on around the world. 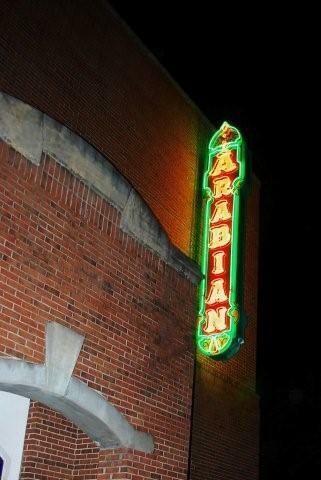 Of all of the downtown theatres, the last one standing is the Arabian. Luckily the Laurel Little Theatre bought the empty building in 1977, and LLT's presence ensures it will survive for many years to come. The Pinehurst Hotel had been built at the turn of the century and eventually expanded with a new wing on its northern side. 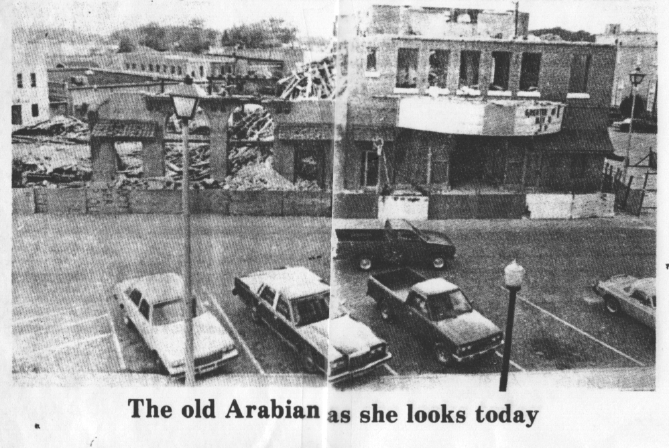 The Arabian was constructed just behind that new wing sharing a common wall with the hotel. There was a 50-foot long entrance arcade into the theatre that actually passed underneath three floors of hotel rooms. The Arabian opened on April 1, 1927, just before the stock market crash that ended the explosion of movie palaces that were built in the 20s. Laurel businessmen Charles Green and Ben Schneider were investors with Sank Taylor, and eventually the Saenger Brothers Amusement Company out of New Orleans also joined in the operation. The design came out of Emile Weil's architectural firm. Weil designed many of the Saenger Theatres across the coast including the namesake houses in Mobile, Biloxi, Hattiesburg and New Orleans. 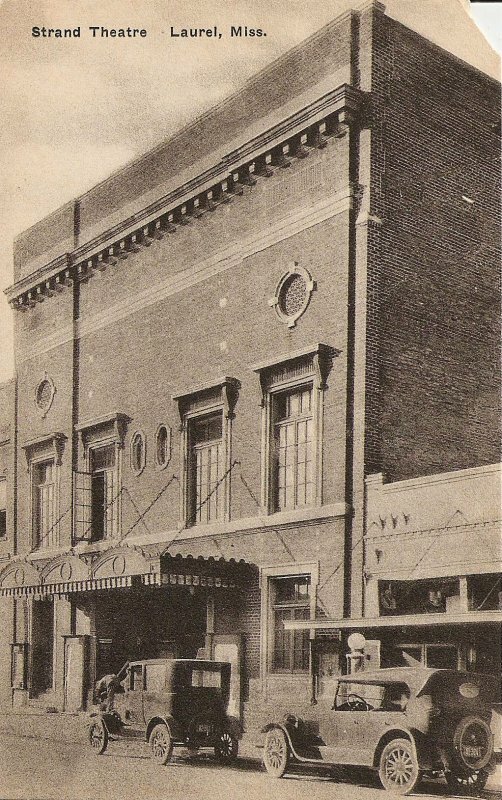 The Arabian was the smallest of Weil's Saenger houses, but still seated a respectable 900 moviegoers and had a small vaudeville lip stage and an impressive Kilgen 'Wonder Organ' that was in continuous use producing melodies and sound effects to enhance the silent flicks up on the screen. The first manager of the theatre was Reuben DeGruy, and his wife Ruth was the organist for years and years. Those silent films continued until the 'talkies' had taken over completely in the 1930s, but Ruth would still entertain on the organ in between the films. The organ disappeared a couple decades later, and we've never been able to trace it down. Let us know if you happen to have any clues about its whereabouts. The interior was a design mix of Arabic, Egyptian, Persian and Moroccan influences, all of which were the standard of the grand movie palaces being built during the 1920s. The interest in that foreign part of our world was caused by the never-ending newspaper headlines about the amazing discovery of King Tut's tomb in 1922. The designs of those far-away lands became all the rage, and the vast majority of the spectacular new movie houses were a mix of styles from those dry desert countries with a bit of Art Deco touches thrown in for good measure. When the Arabian opened in 1927, admission was 35cents for matinees, 50cents in the evening and 10cents for children. The very first attraction was the silent movie It starring Clara Bow. Opening day was such a big event that the newspaper at that time, the Laurel Daily-Leader, featured an entire tabloid section on the theatre. All of those articles are now posted on this website. Click here to read them. Sank Taylor remained involved with the business until it was sold many decades later to Gulf States Theatres. Movies were shown on the big screen until the modern cineplexes started killing the attendance at all the old single-screen theatres around the country, and after fifty years the Arabian had its last movie projected in 1976. It sat empty for just one year before the Laurel Little Theatre bought the property and refurbished the interior to its former glory. A budget of $80,000 and thousands of volunteer hours were needed to purchase and renovate the building before we opened our 1977-78 season in the theatre. There was no real stage in the Arabian, so during those 1977 renovations LLT workers removed the front half of the seats in the orchestra level and then built out a thirty foot wide stage with wingspace and dressing rooms. A new proscenium arch was patterned after the architectural features on the original 1927 arch that framed the movie screen at the back wall. The lobby and auditorium is now just as it was in 1927, but the proscenium arch and stage are circa 1977. One detail preserved on the new arch is the Egyptian Winged Sun that locals called the 'sun phoenix.' That piece of art was originally on the back wall, but was moved forward and placed on the new proscenium during the renovation. Archaeologists think the Egyptians imagined the Sun actually had 'wings' and had gotten this belief from the observations during total solar eclipses of various sunspot steamers and polar rays shooting out from the darkened moon covering the sun. Those solar burst halos can resemble the wings and tail feathers of some celestial bird and they would have been visible even during that ancient time. The Arabian's balcony was originally built at an angle to view movies at a much higher height than the present day stage level. It's not steep enough to have proper sight lines for the new stage, so all of the balcony seats were removed and that area is now used only for stage lighting and costume and set storage. When the Arabian closed in 1976, the Pinehurst Hotel still stood out front even though it had been closed for years. The hotel was eventually condemned and demolished in 1988, and once again, LLT raised the funds to 'Save The Arabian' as the common wall the hotel and the theatre shared had to be reconstructed as the theatre's new exterior wall facade. The only surviving clues to the Pinehurst and the long theatre entryway arcade are the remaining tiles in the now open-air courtyard floor. Over the next two decades from 1988-2008, LLT presented its annual seasons of shows and also hosted Community Concerts, school and convention presentations, beauty pageants, touring shows and concerts. All of that slowly took its toll on the 80-year-old building, so once again renovations were in store. A 2008 drive to raise $125,000 and then a nine month closure to install all new seating and carpets, repaint and restore original 1927 art designs, rebuild and light the exterior ARABIAN neon sign and build an archway in the courtyard to feature the Pinehurst Park next door have all brought the grand ol' lady back into the limelight in our downtown. Long range plans are to build an annex along the south side of the building. This would add much needed backstage wingspace and set storage towards the back half of the building and a new kitchen and additional bathrooms along the front of the house. The eight-decade-old building has seen many, many movies over the years, and now a long legend of stage performances have taken the Arabian into the 21st century. Coming full circle, we've just installed a movie projector once again and inaugurated it with a viewing of the old John Wayne movie Hatari.....now if only that old sheet Sank Taylor first hung on that wall back in 1907 could be found, that would truly be the full circle.